ConceptDrawis the best drawing software for Mac that gives the ability to draw diagrams like flowcharts, bar charts, histograms, pie charts, divided bar diagrams, line graphs, area charts, scatter plots and others. Basic Diagramming solution includes 100+ of professional-looking business templates and examples that you can modify and make your own graphic documentation. Sample 1. 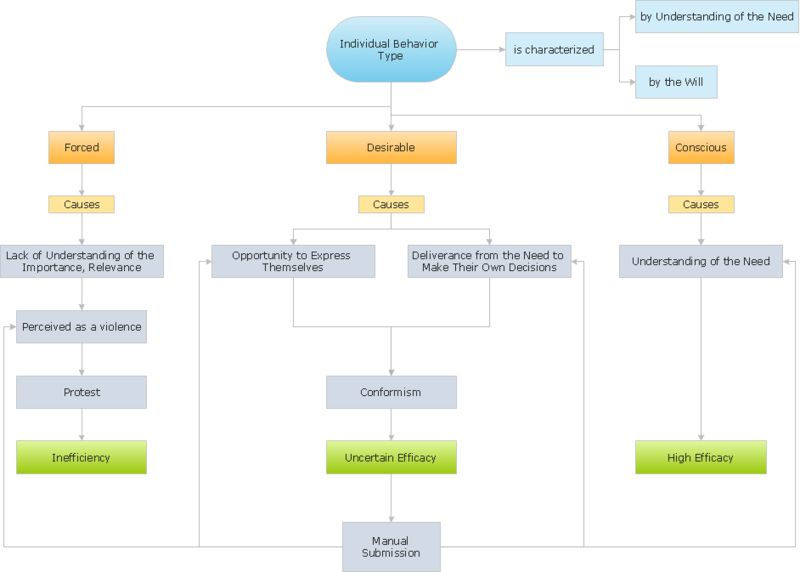 Types of individual behavior in organization - Block diagram. ConceptDraw DIAGRAM ector diagramming and business graphics software enhanced with with templates, samples and stencil libraries from ConceptDraw Solution Park helps you to easily draw flowcharts, block diagrams, bar charts, histograms, pie charts, divided bar diagrams, line graphs, area charts, scatter plots, circular arrows diagrams, Venn diagrams, bubble diagrams, concept maps, and others. Use ConceptDraw DIAGRAM with Solution Park to draw you own diagrams, charts and graphs for graphic communication, explanation of business and personal ideas and concepts, simple visual presentation of numerical data, complex structures, logical relations, step-by-step flows of actions, operations or math algorithm.